I am very proud to be able to share this information with you all! Nikola Tesla’s atmospheric air pressure powered Rotary Air Engine aka "Tesla Turbine"
Add the air valve from his later patent 1,329,559 and use either of these methods to start the turbine by creating a vacuum. It’s all in the patents. Create a vacuum and the one way air valve will only allow atmospheric pressure in. The high internal vortex air being only able to exit the exhaust ports which instantly increases the vacuum. The magic ingredient is the "almost frictionless bearings. Tesla used air bearings powered by the devices own vacuum! How clever is that! Magnetic bearings are also favourable providing they are stable. Go to 2:25 in the video. It’s Tesla’s best design for a controllable tornado in a box and he hid it well from the right people but I was able to follow the Hansel & Gretel breadcrumb trail through his patents. I’m a few weeks away from an awesome set of permanent magnetic bearings for this! Last edited by soundiceuk; 03-01-2019 at 09:15 AM. What a genius invention! Tesla hid the truth between 8 patents. The turbine is designed to run on the heat in atmospheric air. A vacuum hand primer connected between the one way valve and the turbine is the easiest method used to start the turbine. It is like a car engine only with atmospheric air as fuel and it is constantly on power stroke with no moving valves. Once a vacuum is created it makes its own vacuum from the volume of air leaving the exhaust ports. Bare in mind it has no permanent magnetic bearings, one way air diode, no vacuum applied to exhaust instead of using compressed air. I've got loads more research on this but thought I would start the ball rolling by spreading the news! Last edited by soundiceuk; 01-27-2019 at 10:02 AM. Ok guys, seriously what are doing messing around with any other technology? Tesla has given us the greatest gift possible. The Tesla turbine runs on air! It is single stroke engine! It’s moves atmospheric air pressure to lower air pressure through the turbine. In doing so it makes it own vacuum. I can provide all the references written by Tesla spreading over 9 patents. Tesla left a Hansel and Gretel trail and I happened to find it in my search for the ultimate magnetic bearing design. Have you ever stopped to think about why when you open a door another door violently slams shut? You created a vacuum and the high pressure cold air rapidly flows to the warmer low pressure air. This movement shoved a large portion of air out of the door that creates a vacuum which is why the door slams violently. Using a Tesla turbine and a Tesla valve we can harness this naturally occurring phenomenon. Hi folks, one of the methods I discovered whilst on my research travels was printing patents out in A3. It allows me to look at them longer without eye strain and I am able to go into a meditative state while reading them. The eye strain of A4 makes me lose concentration and get tired quickly. Page 1 "Fig 4 is a plan showing the manner in which the invention is, or may be used, to operate a fluid propelled rotary engine or turbine"
3. Page 3 - Line 28 "Fig 4. exemplifies a particularly valuable application of the invention to which reference has been made above. The drawing show in vertical cross section a turbine which may be of any type but is in this instance one invented and described by me"
4. Page 3 - Line 79 "Its use, however, while advantageous, is not indispensable the suction produced by the turbine rotor itself being, in some cases at least, sufficient to insure proper working. This detail is omitted from the drawing as unessential to the understanding"
5. Page 3 - Line 96 "Upon the subsidence of the explosion the pressure in the chamber sinks below the atmospheric owing to the pumping action of the rotor or ventilator and new air and gas is permitted to enter, cleaning the cavity and channels and making up a fresh mixture"
6. Page 3 - Line 105 "After a short lapse of time the chamber becomes heated to such a degree that the ignition may be shut off without disturbing the established regime. 7. Page 3 - Line 117 "When the chamber is small an auxiliary means for starting, as compressed air, may be resorted to"
8. Page 4 - Line 12 "provision made for maintaining a vacuum at the exhaust"
9. Page 4 - Line 31 "I do not claim the methods of and apparatus for the propulsion of fluids and thermodynamic transformation of energy herein disclosed, as these will be made subjects of separate applications"
I've got some more to add to this but here is my rough list for this patent. "Tesla's New Monarch of Machines"
Suppose some one should discover a new mechanical principle--something as fundamental as James Watt—s discovery of the expansive power of steam—by the use of which it became possible to build a motor that would give ten horse power for every pound of the engine—s weight, a motor so simple that the veriest novice in mechanics could construct it and so elemental that it could not possibly get out of repair. Then suppose that this motor could be run forward or backward at will, that it could be used as either an engine or a pump, that it cost almost nothing to build as compared with any other known form of engine, that it utilized a larger percentage of the available power than any existing machine, and, finally, that it would operate with gas, steam, compressed air or water, any one of them, as its driving power. It does not take a mechanical expert to imagine the limitless possibilities of such an engine. It takes very little effort to conjure up a picture of a new world of industry and transportation made possible by the invention of such a device. —Revolutionary— seems a mild term to apply to it. 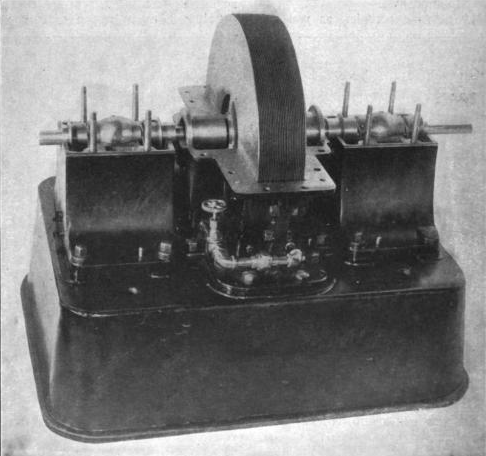 That, however, is the word the inventor uses in describing it—Nikola Tesla, the scientist whose electrical discoveries underlie all modern electrical power development, whose experiments and deductions made the wireless telegraph possible, and who now, in the mechanical field, has achieved a triumph even more far reaching than anything he accomplished in electricity. There is something of the romantic in this discovery of the famous explorer of the hidden realms of knowledge. The pursuit of an ideal is always romantic, and it was in the pursuit of an ideal which he has been seeking twenty years that Dr. Tesla made his great discovery. That ideal is the power to fly—to fly with certainty and absolute safety—not merely to go up in an aeroplane and take chances on weather conditions, —holes in the air,— tornadoes, lightning and the thousand other perils the aviator of today faces, but to fly with the speed and certainty of a cannon ball, with power to overcome any of nature—s aerial forces, to start when one pleases, go whither one pleases and alight where one pleases. That has been the aim of Dr. Tesla—s life for nearly a quarter of a century. He believes that with the discovery of the principle of his new motor he has solved this problem and that incidentally he has laid the foundations for the most startling new achievements in other mechanical lines. There was a time when men of science were skeptical—a time when they ridiculed the announcement of revolutionary discoveries. Those were the days when Nikola Tesla, the young scientist from the Balkans, was laughed at when he urged his theories on the engineering world. Times have changed since then, and the —practical— engineer is not so incredulous about —scientific— discoveries. The change came about when young Tesla showed the way by which the power of Niagara Falls could be utilized. The right to divert a portion of the waters of Niagara had been granted; then arose the question of how best to utilize the tremendous power thus made available—how to transmit it to the points where it could be commercially utilized. An international commission sat in London and listened to theories and practical plans for months. 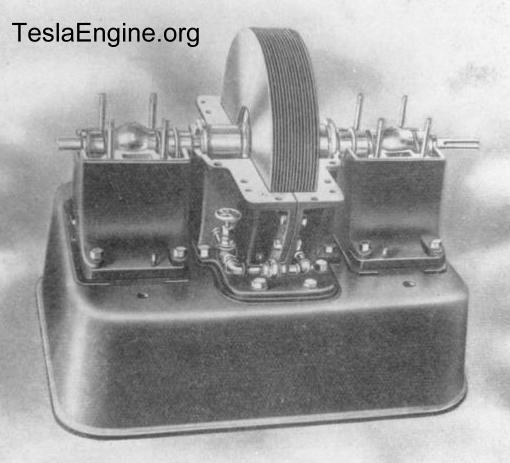 Then came the announcement of young Tesla—s discovery of the principle of the alternating current motor. Practical tests showed that it could be built—that it would work. That discovery, at that opportune time, decided the commission. Electricity was determined upon as the means for the transmission of Niagara—s power to industry and commerce. Today a million horse power is developed on the brink of the great cataract, turning the wheels of Buffalo, Rochester, Syracuse and the intervening cities and villages operating close at hand the great new electro-chemical industries that the existence of this immense source of power has made possible, while all around the world a thousand waterfalls are working in the service of mankind, sending the power of their —white coal— into remote and almost inaccessible corners of the globe, all because of Nikola Teslas first great epoch making discovery. —It is the greatest invention in a century,— wrote one of the foremost American engineers, a man whose name stands close to the top of the list of those who have achieved scientific fame and greatness. —No invention of such importance in the automobile trade has yet been made,— declared the editor of one of the leading engineering publications. Experts in other engineering lines pointed out other applications of the new principle and letters asking for further information poured in on Dr. Tesla from the four quarters of the globe. —Oh, I've had too much publicity,— he said, when I telephoned to him to ask for an interview in order to explain his new discovery to the non-technical public. It took a good deal of persuasion before he reluctantly fixed an hour when he would see me, and a good bit more after that before he talked at all freely. When he did speak, however, he opened up vistas of possible applications of the new engine that staggered the imagination of the interviewer. Looking out over the city from the windows of his office, on the twentieth floor of the Metropolitan Tower, his face lit up as he told of his life dream and its approaching realization, and the listener—s fancy could almost see the air full of strange flying craft, while huge steamships propelled at unheard of speeds ploughed the waters of the North River, automobiles climbed the very face of the Palisades, locomotives of incredible power whisked wheeled palaces many miles a minute and all the discomforts of summer heat vanished as marvelous refrigerating plants reduced the temperature of the whole city to a comfortable maximum—for these were only a few of the suggestions of the limitless possibilities of the latest Tesla discovery. —Just what is your new invention?— I asked. —I have accomplished what mechanical engineers have been dreaming about ever since the invention of steam power,— replied Dr. Tesla. —That is the perfect rotary engine. It happens that I have also produced an engine which will give at least twenty-five times as much power to a pound of weight as the lightest weight engine of any kind that has yet been produced. —In doing this I have made use of two properties which have always been known to be possessed by all fluids, but which have not heretofore been utilized. These properties are adhesion and viscosity. —Put a drop of water on a metal plate. The drop will roll off, but a certain amount of the water will remain on the plate until it evaporates or is removed by some absorptive means. The metal does not absorb any of the water, but the water adheres to it. —The drop of water may change its shape, but until its particles are separated by some external power it remains intact. This tendency of all fluids to resist molecular separation is viscosity. It is especially noticeable in the heavier oils. —It is these properties of adhesion and viscosity that cause the —skin friction— that impedes a ship in its progress through the water or an aeroplane in going through the air. All fluids have these qualities—and you must keep in mind that air is a fluid, all gases are fluids, steam is fluid. Every known means of transmitting or developing mechanical power is through a fluid medium. —There we have a disk, or rather a series of disks, revolving in a fluid—the air,— said the inventor. —You need no proof to tell you that the air is being agitated and propelled violently. If you will hold your hand over the centre of these disks—you see the centres have been cut away—you will feel the suction as air is drawn in to be expelled from the peripheries of the disks. —Now, suppose these revolving disks were enclosed in an air tight case, so constructed that the air could enter only at one point and be expelled only at another—what would we have?" —You'd have an air pump,— I suggested. —Exactly--an air pump or blower,— said Dr. Tesla. —Suppose now we reversed the operation,— continued the inventor. —You have seen the disks acting as a pump. Suppose we had water, or air under pressure, or steam under pressure, or gas under pressure, and let it run into the case in which the disks are contained—what would happen?" —The disks would revolve and any machinery attached to the shaft would be operated—you would convert the pump into an engine,— I suggested. —That is exactly what would happen—what does happen,— replied Dr. Tesla. —You have got what Professor Langley was trying to evolve for his flying machine—an engine that will give a horse power for a pound of weight,— I suggested. —That means the solution of the problem of flying,— I suggested. —Then, too,— Dr. Tesla went on, —there are no delicate adjustments to be made. The distance between the disks is not a matter of microscopic accuracy and there is no necessity for minute clearances between the disks and the case. All one needs is some disks mounted on a shaft, spaced a little distance apart and cased so that a fluid can enter at one point and go out at another. If the fluid enters at the centre and goes out at the periphery it is a pump. If it enters at the periphery and goes out at the center it is a motor. —Coupling these engines in series, one can do away with gearing in machinery. Factories can be equipped without shafting. The motor is especially adapted to automobiles, for it will run on gas explosions as well as on steam. The gas or steam can be let into a dozen ports all around the rim of the case if desired. It is possible to run it as a gas engine with a continuous flow of gas, gasoline and air being mixed and the continuous combustion causing expansion and pressure to operate the motor. The expansive power of steam, as well as its propulsive power, can be utilized as in a turbine or a reciprocating engine. By permitting the propelling fluid to move along the lines of least resistance a considerably larger proportion of the available power is utilized. —As an air compressor it is highly efficient. There is a large engine of this type now in practical operation as an air compressor and giving remarkable service. Refrigeration on a scale hitherto never attempted will be practical, through the use of this engine in compressing air, and the manufacture of liquid air commercially is now entirely feasible. —And it makes the aeroplane practical,— I suggested. —Not the aeroplane, the flying machine,— responded Dr. Tesla. —Now you have struck the point in which I am most deeply interested—the object toward which I have been devoting my energies for more than twenty years—the dream of my life. It was in seeking the means of making the perfect flying machine that I developed this engine. —Twenty years ago I believed that I would be the first man to fly; that I was on the track of accomplishing what no one else was anywhere near reaching. I was working entirely in electricity then and did not realize that the gasoline engine was approaching a perfection that was going to make the aeroplane feasible. There is nothing new about the aeroplane but its engine, you know. —What I was working on twenty years ago was the wireless transmission of electric power. My idea was a flying machine propelled by an electric motor, with power supplied from stations on the earth. I have not accomplished this as yet, but am confident that I will in time. —An aeroplane driven by your engine?— I asked. —Not at all,— said Dr. Tesla. —The aeroplane is fatally defective. It is merely a toy—a sporting play-thing. It can never become commercially practical. It has fatal defects. One is the fact that when it encounters a downward current of air it is helpless. The —hole in the air— of which aviators speak is simply a downward current, and unless the aeroplane is high enough above the earth to move laterally but can do nothing but fall. —There is no way of detecting these downward currents, no way of avoiding them, and therefore the aeroplane must always be subject to chance and its operator to the risk of fatal accident. Sportsmen will always take these chances, but as a business proposition the risk is too great. —The flying machine of the future—my flying machine—will be heavier than air, but it will not be an aeroplane. It will have no wings. It will be substantial, solid, stable. You cannot have a stable airplane. The gyroscope can never be successfully applied to the airplane, for it would give a stability that would result in the machine being torn to pieces by the wind, just as the unprotected aeroplane on the ground is torn to pieces by a high wind. —You will get stability through gyroscopes?— I asked. —Through gyroscopic action of my engine, assisted by some devices I am not yet prepared to talk about,— he replied. —Powerful air currents that may be deflected at will, if produced by engines and compressors sufficiently light and powerful, might lift a heavy body off the ground and propel it through the air,— I ventured, wondering if I had grasped the inventor—s secret. This is Tesla's first flying machine patent. It seems that every patent that made it out there after Wardenclyffe was destroyed, was a puzzle piece to Tesla's turbine and ultimately his flying machine. 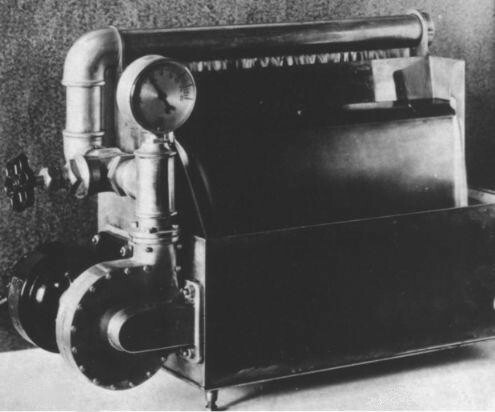 "To accomplish this a light and powerful prime mover is necessary and as particularly suited for the purpose I employ, preferably, a turbine of the kind described in my US patent 1,061,206, of May 6, 1913, which not only fulfills these requirements, but is especially adapted to operation at high temperatures." 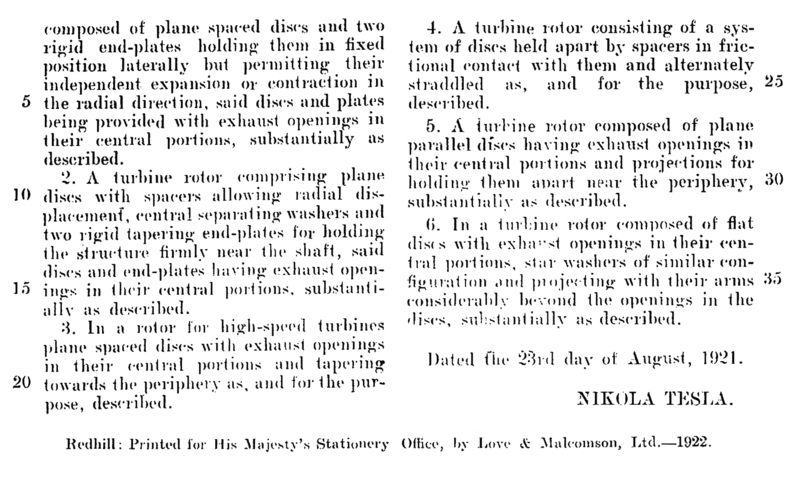 "The motors 2, 2 in this case turbines of the kind described in my patent before referred to"
"At the start, sufficient power being turned on by suitable means, also within his reach"
"Evidently also, whenever necessary or desirable, power far in excess of that normally required may be applied during flight and the machine propelled at a greatly increased speed. The type of turbine used is a motor of great lightness and activity and lends itself exceptionally to this kind of work for which ordinary aviation motors are unsuited. It is capable of carrying a great overload and running without danger at excessive speed so that during the starting and landing operations the necessary power can be developed by the motors even though less efficiently than under their normal working conditions"
"Especially good practical results are obtainable by use of my turbine which can be depended upon to develop the necessary energy for lifting, even if it should be considerably greater than that consumed in flight under normal conditions. This end can be conveniently attained by temporarily supplying more of the working fluid to the rotor and driving it faster"
I'm still pulling apart other patents. What is interesting is the following patent 1,655,114 which I will pull apart for you next. This guy's comments in YouTube seem to make sense on the surface. "I know the answer: This turbine uses the boundary layer effect. That is like friction that the air has with the surfaces inside- you know that part already. This type of friction has two modes: static and kinetic. Just as with a brick sliding on the floor, the coefficient of friction is much higher from stationary than when the brick is already moving. Hence, once the turbine gets to a high enough speed, the coefficient of friction increases and the motor becomes nearly 100% efficient. This is an over celebrated effect though, because the motor cannot be in this efficient zone if it is actually doing something useful. That's why bladed turbines are used in real world situations.﻿"
"Yes, Pedro, I'd love to go into detail. When the blades are going close (enough) to the speed of the incoming air, the RELATIVE speed of the air and the blades is low, hence, the STATIC coefficient of friction starts to take hold. This causes the blades to start going exactly the same speed as the incoming air, which is a rare 100% efficiency. If a load is on the turbine, this will not happen. So people are always running these Tesla turbines with no load, where they excel well: going fast and doing nothing useful. Loaded, though, they might not even turn at all! Hence, as I said, bladed turbines are the real world use. IF you get the tesla turbine to that 100% efficient zone, you may be able to connect a load WHILE it's spinning and gain a useful advantage, but if the load is too much, the kinetic coefficient of air friction comes in , and the turbine will become nearly useless again.﻿"
I don't know if it is just increasing efficiency or if the turbine is causing a suction that exceeds the pressure of the incoming air. If so, maybe in can feed itself at a high enough speed. That guy posting that comment doesn't think it will happen under load. I don't know. Maybe gear up a motor to spin the shaft of one at high speed while pumping water and see it at a certain speed the motor becomes unloaded. That might be a first basic test. Maybe some others with experience with Tesla Turbines can comment?? Last edited by Aaron; 11-21-2018 at 09:40 PM. "A pressure/friction device that operates with a potential difference. If you used the turbine as an energy storage device ( flywheel storage ) then the magnetic / air bearings would make sense. A 200 lb flywheel, 3ft in diameter spinning at 50,000 rpm would supply a 95 hp ( over 70,000 watts ) output for 41 minutes. Run a bank of them with some being charged while others are being discharged and you have a power station." Taking a load will slow down the turbine a little. Just like a fly would slow down a train! Depends on how big the load I guess! Tesla wasn't using magnetic bearings, he was using air bearings powered by atmospheric pressure. Also the load is drawn off the 2nd stage low RPM turbine while the 1st stage turbine retains high RPMs. Most people remember Nikola Tesla for his work and revelations in the field of electrical energy and the invention of radio. However, Tesla had a life long interest in developing a flying machine. Tesla had envisioned himself as the first man that would fly. He had planned to build an aircraft that would operate on electric motors. However, the first men who successfully flew an aircraft used the reciprocating internal combustion engine. Though successful in achieving flight, aircraft using these engines were dangerous and unpredictable, due to the engine's lack of adequate power. Tesla turned his attention to revamping the internal combustion engine so as to make flying safe for all and minimize its environmental impact. Documented in this text is the result of Tesla's endeavors and the resulting marvel of machines called the Bladeless Boundary- Layer Turbine. Although Tesla's dream for his engines application in aircraft was not realized in his life time, if allowed to be used in aircraft today, it would provide a quiet, safe, simple and efficient alternative to our supposedly advanced bladed turbine aircraft engines. It has been estimated that an increase in fuel efficiency of a factor of three could be realized in aircraft and thus substantially reduce pollution. Not only this, the Bladeless Tesla Turbine Engine can turn at much higher speeds with total safety. If a conventional bladed turbine engine goes critical or fails, watch out, you have exploding parts slicing through hydraulic lines, control surfaces and maybe even you. With the Bladeless Tesla Turbine this is not a danger because it will not explode. If it does go critical, as has been documented in tests at 85,000 rpm, the failed component will not explode but implode into tiny pieces which are ejected through the exhaust while the undamaged components continue to provide thrust to keep you airborne. We. can only speculate on the human suffering that could and should be averted. The application of this amazing engine was not to be limited to aircraft. Tesla was setting up plans to replace what he considered the wasteful, polluting, inefficient and complicated reciprocating engine in all its applications, including the automobile. Tesla's small but powerful engine has only one moving part and is 95% efficient, which means tremendous mileage. It runs vibration free and doesn't even require a muffler. Not only is this engine 95% efficient, as compared to 25% efficiency or less of the conventional gas engine, it can run efficiently on any fuel from sawdust to hydrogen with no wear on the internal engine components. This engine's speed-torque characteristic allows full torque at the bottom of the speed range eliminating the conventional shifting gear transmission. This provides additional economy as the expensive, complicated and wear prone transmission is eliminated. Unlike most people of the time, Tesla was very concerned about the long range environmental damage the reciprocating engines would create. He stressed over and over how we must take the long range view and not step out of harmony with our life support systems. Today the widening concern for Spaceship Earth and the renewal of an old ethic "We don't inherit the Earth from our ancestors, we borrow it from our children" is slowly beginning to awaken people to the concerns of Tesla. Although the existence of the automobile on city streets dates back to the first years of the century, its role as a contributor to air contamination did not receive wide acceptance among scientists until the 60's. Factual evidence that urban area smog was chemically related to automobile emissions had been produced and acknowledged by scientific groups in the 1950's. Despite vehement disagreement which ensued between government and the automotive industry on this volatile issue, research and development programs were initiated by both groups in an effort to identify the reciprocating internal combustion engine's sources of pollution and determine what corrective action might be taken. Obviously Tesla's ounce of prevention was not heeded, leaving us with well over the pound required for a cure with nearly half of all air pollution caused by the reciprocating internal combustion engine. The Boundary Layer Turbine is not only an engine that is hard to comprehend by our currently imposed standards, but can also be used as a pump with slight modification. And like its cousin the engine, it has Herculean power. Unlike conventional pumps that are easily damaged by contaminants, the Bladeless Tesla Pump can handle particles and corrosives in stride as well as gases with no cavitation effect that destroys, in short order, conventional type pumps. These pumps and engines, though unknown to most, are available for commercial sale. If large scale commercial production was implemented, these engines and pumps would be extremely affordable due to their simplicity of manufacture, longevity, almost total lack of maintenance and the added bonus that they require no crank case oil. Almost a quarter of the air pollution today comes from the coal being burned to generate electricity. Fuel consumption, resulting in air pollution and acid rain, could be significantly reduced simply by replacing the conventional blade steam turbines currently used by utilities with the Bladeless Tesla Steam Turbine. This also would have the added bonus of drastically reducing maintenance. But the real solution lies in using low temperature wet steam occurring naturally from the ground in the form of geothermal energy. This energy would destroy a conventional bladed steam turbine, unless expensive steam drying is employed. 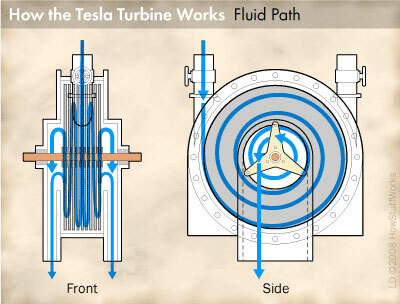 However, the Bladeless Tesla Steam Turbine requires no drying and can be connected directly to the geothermal source. It has been estimated that the geothermal potential in just Southern California alone, could power the entire North American Continent with NO POLLUTION! Large oil companies have comprehended the potential of geothermal energy and have purchased many of these large tracks of prime geothermal land. Due to the revolutionary concepts embodied in this engine, we can easily end the so called energy crisis and dramatically reduce pollution. Even the vested energy interests are beginning to understand that now is the time for change, realizing their future health and wealth is directly linked to that of the environment. You can't hide or buy your way out of a devastated planet. There must also be a move forward for the many misinformed environmentalists who see our future as one of regression from technology instead of its proper usage. Tesla from his 1919 autobiography, My Inventions: "My alternating system of power transmission came at a psychological moment, as a long-sought answer to pressing industrial questions, and although considerable resistance had to be overcome and opposing interests reconciled, as usual, the commercial introduction could not be long delayed. Now, compare this situation with that confronting my turbine, for example. One should think that so simple and beautiful an invention, possessing many features of an ideal motor, should be adopted at once and, undoubtedly, it would under similar conditions. But the prospective effect of the rotating field was not to render worthless existing machinery; on the contrary, it was to give it additional value. The system lent itself to new enterprise as well as to improvement of the old. My turbine is an advance of a character entirely different. It is a radical departure in the sense that its success would mean the abandonment of the antiquated types of prime movers on which billions of dollars have been spent. Under such circumstances the progress must needs be slow and perhaps the greatest impediment is encountered in the prejudicial opinions created in the minds of experts by organized opposition." H.G. Wells once said that future history will be a race between education and catastrophe. This book is dedicated to the race for education. 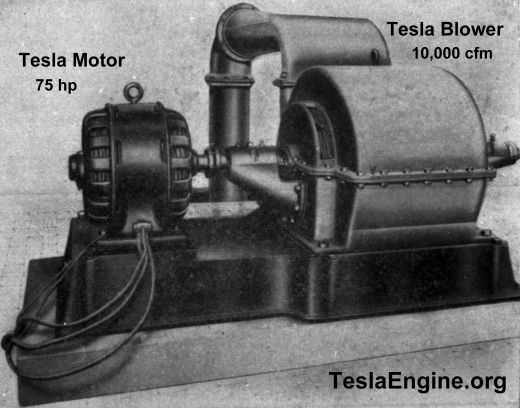 Reprinted from: Boundary-Layer Breakthrough - The Tesla Bladeless Turbine pages 114-118. 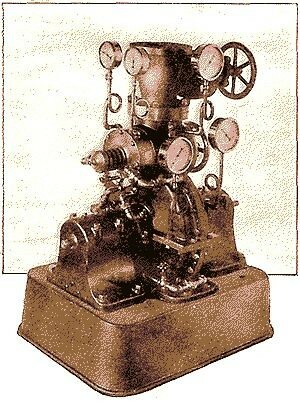 A MARKED step was taken in the simplification of prime movers when Watt's cumbersome beam engine, with its ingenious but elaborate parallel motion, gave way to the present standard reciprocating type, with only piston rod, cross head and connecting rod interposed between piston and crank. 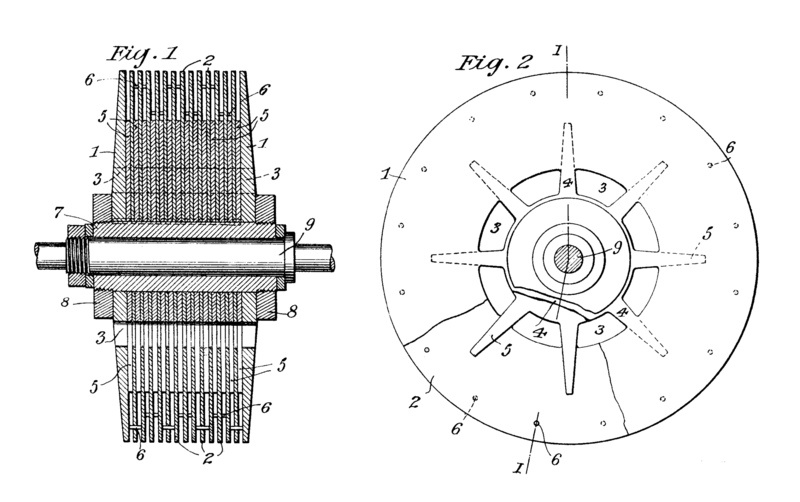 An even greater advance toward ideal simplicity occurred when, after years of effort by inventors to produce a practical rotary, Parsons brought out his compact, though costly, turbine, in which the energy of the steam is developed on a zig-zag path through multitudinous rows of fixed and moving blades. 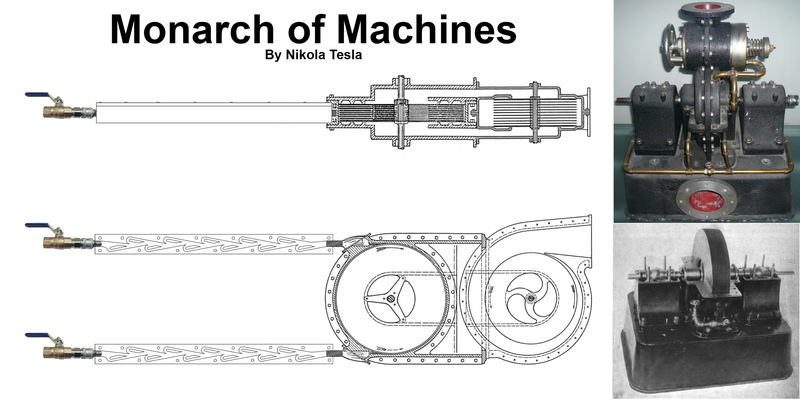 And now comes Mr. Tesla with a motor which bids fair to carry the steam engine another long step toward the ideally simple prime mover - a motor in which the fixed and revolving blades of the turbine give place to a set of steel disks of simple and cheap construction. If the flow of steam in spiral curves between the adjoining faces of flat disks is an efficient method of developing the energy of the steam, the prime mover would certainly appear to have been at last reduced to its simplest terms. The further development of the unique turbine which we describe elsewhere will be followed with close attention by the technical world. The results attained with this small high-pressure unit are certainly flattering, and give reason to believe that the addition of a low pressure turbine and a condenser would make this type of turbine as highly efficient as it is simple and cheap in construction and maintenance. It will interest the readers of the Scientific American to that Nikola Tesla, whose reputation must, naturally, stand upon the contribution he made to electrical engineering when the art was yet in its comparative infancy, is by training and choice a mechanical engineer, with a strong leaning to that branch of it which is covered by the term "steam engineering." For several years past he has devoted much of his attention to improvements in thermo-dynamic conversion, and the result of his theories and practical experiments is to be found in an entirely new form of prime movers shown in operation at the waterside station of the New York Edison Company, who kindly placed the facilities of their great plant at his disposal for carrying on experimental work. By the courtesy of the inventor, we are enabled to publish the accompanying views, representing the testing plant at the Waterside station, which are the first photographs of this interesting motor that have yet been made public. The basic principle which determined Tesla's investigations was the well-known fact that when a fluid (steam, gas or water) is used as a vehicle of energy, the highest possible economy can be obtained only when the changes in velocity and direction of the movement of the fluid are made as gradual and easy as possible. In the present forms of turbines in which the energy is transmitted by pressure, reaction or impact, as in the De Laval, Parsons, and Curtiss types, more or less sudden changes both of speed and direction are involved, with consequent shocks, vibration and destructive eddies. Furthermore, the introduction of pistons, blades, buckets, and intercepting devices of this general class, into the path of the fluid involves much delicate and difficult mechanical construction which adds greatly to the cost both of production and maintenance. The desiderata in an ideal turbine group themselves under the heads of the theoretical and the mechanical. The theoretically perfect turbine would be one in which the fluid was so controlled from the inlet to the exhaust that its energy was delivered to the driving shaft with the least possible losses due to the mechanical means employed. The mechanically perfect turbine would be one which combined simplicity and cheapness of construction, durability, ease and rapidity of repairs, and a small ratio of weight and space occupied to the power delivered on the shaft. Mr. Tesla maintains that in the turbine which forms the subject of this article, he has carried the steam and gas motor a long step forward toward the maximum attainable efficiency, both theoretical and mechanical. That these claims are well founded is shown by the fact that in the plant at the Edison station, he is securing an output of 200 horse-power from a single-stage steam turbine with atmospheric exhaust, weighing less than 2 pounds per horse-power, which is contained within a space measuring 2 feet by 3 feet, by 2 feet in height, and which accomplishes these results with a thermal fall of only 130 B.T.U., that is, about one-third of the total drop available. 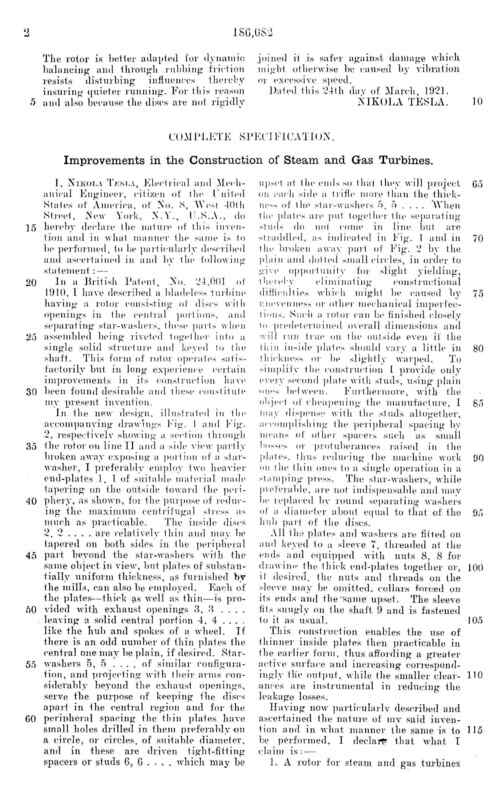 Furthermore, considered from the mechanical standpoint, the turbine is astonishingly simple and economical in construction, and by the very nature of its construction, should prove to possess such a durability and freedom from wear and breakdown as to place it, in these respects, far in advance of any type of steam or gas motor of the present day. Briefly stated, Tesla's steam motor consists of a set of flat steel disks mounted on a shaft and rotating within a casing, the steam entering with high velocity at the periphery of the disks, flowing between them in free spiral paths, and finally escaping through exhaust ports at their center. Instead of developing the energy of the steam by pressure, reaction, or impact, on a series of blades or vanes, Tesla depends upon the fluid properties of adhesion and viscosity--the attraction of the steam to the faces of the disks and the resistance of its particles to molecular separation combining in transmitting the velocity energy of the motive fluid to the plates and the shaft. By reference to the accompanying photographs and line drawings, it will be seen that the turbine has a rotor A which in the present case consists of 25 flat steel disks, one thirty-second of an inch in thickness, of hardened and carefully tempered steel. The rotor as assembled is 3 1/2 inches wide on the face, by 18 inches in diameter, and when the turbine is running at its maximum working velocity, the material is never under a tensile stress exceeding 50,000 pounds per square inch. The rotor is mounted in a casing D, which is provided with two inlet nozzles, B for use in running direct and B' for reversing. Openings C are cut out at the central portion of the disks and these communicate directly with exhaust ports formed in the side of the casing. In operation, the steam, or gas, as the case may be is directed on the periphery of the disks through the nozzle B (which may be diverging, straight or converging), where more or less of its expansive energy is converted into velocity energy. When the machine is at rest, the radial and tangential forces due to the pressure and velocity of the steam cause it to travel in a rather short curved path toward the central exhaust opening, as indicated by the full black line in the accompanying diagram; but as the disks commence to rotate and their speed increases, the steam travels in spiral paths the length of which increases until, as in the case of the present turbine, the particles of the fluid complete a number of turns around the shaft before reaching the exhaust, covering in the meantime a lineal path some 12 to 16 feet in length. During its progress from inlet to exhaust, the velocity and pressure of the steam are reduced until it leaves the exhaust at 1 or 2 pounds gage pressure. The resistance to the passage of the steam or gas between adjoining plates is approximately proportionate to the square of the relative speed, which is at a maximum toward the center of the disks and is equal to the tangential velocity of the steam. Hence the resistance to radial escape is very great, being furthermore enhanced by the centrifugal force acting outwardly. One of the most desirable elements in a perfected turbine is that of reversibility, and we are all familiar with the many and frequently cumbersome means which have been employed to secure this end. It will be seen that this turbine is admirably adapted for reversing, since this effect can be secured by merely closing the right-hand valve and opening that on the left. 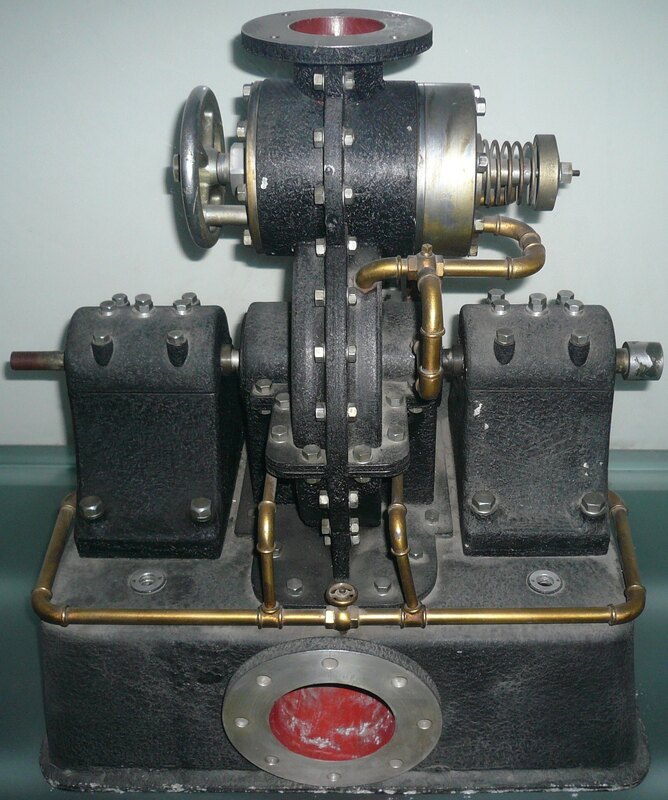 It is evident that the principles of this turbine are equally applicable, by slight modifications of design, for its use as a pump, and we present a photograph of a demonstration model which is in operation in Mr. Tesla's office. This little pump, driven by an electric motor of 1/12 horse-power, delivers 40 gallons per minute against a head of 9 feet. The discharge pipe leads up to a horizontal tube provided with a wire mesh for screening the water and checking the eddies. The water falls through a slot in the bottom of this tube and after passing below a baffle plate flows in a steady stream about 3/4 inch thick by 18 inches in width, to a trough from which it returns to the pump. Pumps of this character show an efficiency favorably comparing with that of centrifugal pumps and they have the advantage that great heads are obtainable economically in a single stage. The runner is mounted in a two-part volute casing and except for the fact that the place of the buckets, vanes, etc., of the ordinary centrifugal pump is taken by a set of disks, the construction is generally similar to that of pumps of the standard kind. In conclusion, it should be noted that although the experimental plant at the Waterside station develops 200 horse-power with 125 pounds at the supply pipe and free exhaust, it could show an output of 300 horse-power with the full pressure of the Edison supply circuit. 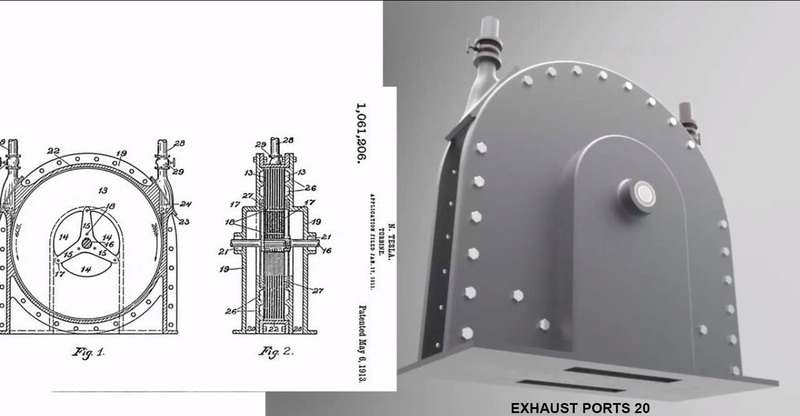 Furthermore, Mr. Tesla states that if it were compounded and the exhaust were led to a low pressure unit, carrying about three times the number of disks contained in the high pressure element, with connection to a condenser affording 28 1/2 to 29 inches of vacuum, the results obtained in the present high-pressure machine indicate that the compound unit would give an output of 600 horse-power, without great increase of dimensions. This estimate is conservative. The testing plant consists of two identical turbines connected by a carefully calibrated torsion spring, the machine to the left being the driving element, the other the brake. In the brake element, the steam is delivered to the blades in a direction opposite to that of the rotation of the disks. Fastened to the shaft of the brake turbine is a hollow pulley provided with two diametrically opposite narrow slots, and an incandescent lamp placed inside close to the rim. As the pulley rotates, two flashes of light pass out of the same, and by means of reflecting mirrors and lenses, they are carried around the plant and fall upon two rotating glass mirrors placed back to back on the shaft of the driving turbine so that the center line of the silver coatings coincides with the axis of the shaft. The mirrors are so set that when there is no torsion on the spring, the light beams produce a luminous spot stationary at the zero of the scale. But as soon as load is put on, the beam is deflected through an angle which indicates directly the torsion. The scale and spring are so proportioned and adjusted that the horse-power can be read directly from the deflections noted. The indications of this device are very accurate and have shown that when the turbine is running at 9,000 revolutions under an inlet pressure of 125 pounds to the square inch, and with free exhaust, 200 brake horse-power are developed. The consumption under these conditions of maximum output is 38 pounds of saturated steam per horse-power per hour - a very high efficiency when we consider that the heat-drop, measured by thermometers, is only 130 B.T.U., and that the energy transformation is effected in one stage. Since about three times this number of heat units are available in a modern plant with super-heat and high vacuum, the above means a consumption of less than 12 pounds per horse-power hour in such turbines adapted to take up the full drop. 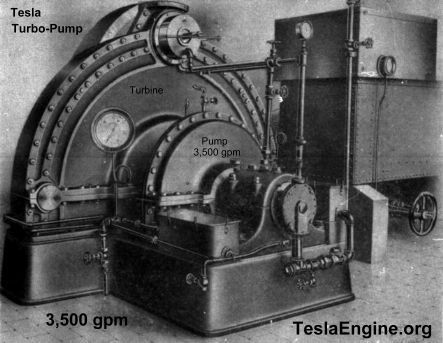 Under certain conditions, however, very high thermal efficiencies have been obtained which demonstrate that in large machines based on this principle, in which a very small slip can be secured, the steam consumption will be much lower and should, Mr. Tesla states, approximate the theoretical minimum, thus resulting in nearly frictionless turbine transmitting almost the entire expansive energy of the steam to the shaft. Journey back to the future and discover the fascinating secret behind the most powerful and economic internal or external combustion engine of all time: Tesla's Bladeless Boundary-Layer Turbine. You will experience the excitement of understanding as Tesla's mechanical breakthrough is explored, shattering the boundaries of our current mechanical standard. You will be swept into the awareness of discovery as the simplicity of this whirl wind machine of natural harmony is revealed. Unveiled here today how it is possible to convert the normally undesired energy of drag into the tremendous vortex energy of Tesla's perfectly controlled mechanical tornado. The real answer to energy. What happens when this turbine hits 50,000rpm? Why does it slow down at the end? My observation is the turbine goes supersonic and draws so much air it empties the tank of the compressor. It slows down at the end because the air inside the turbine has two pathways out and the bearings are not "almost frictionless". At least with a one way valve the air only has one way out. That way out creates a vacuum which draws more air in, creating more vacuum. Tesla didn't call this the monarch of all engines for nothing! They say a picture paints a thousand words..... I hope this one does much more than that! Have you noticed every patent since Wardenclyffe, US or British is to do with the turbine? I have attached a technical drawing to explain what is widely misunderstood about Tesla's invention. Its a dual stage machine if you want torque. I've been doing this in my head for a week or so. Last edited by soundiceuk; 11-27-2018 at 04:17 PM. Every US patent from 103 onwards is related to the turbine. 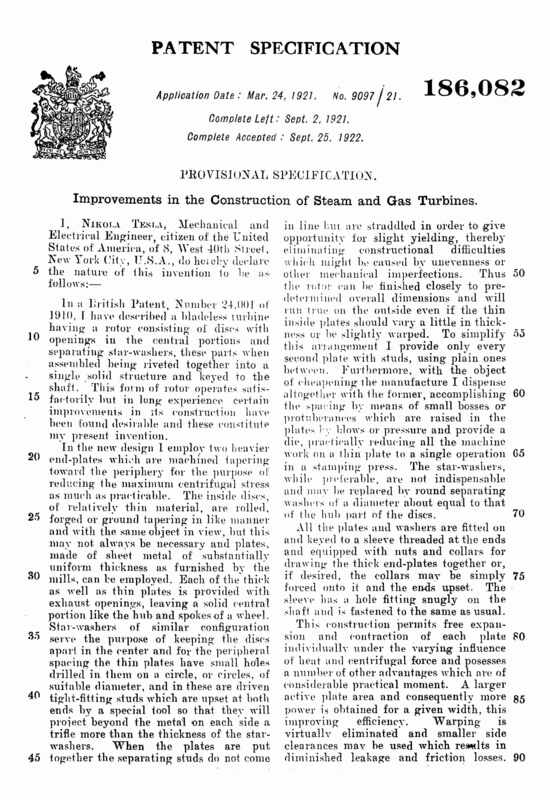 Every British patent from 68 onwards is related to the turbine. Tesla was very clearly trying to tell us something!!! "What I was working on twenty years ago was the wireless transmission of electric power. My idea was a flying machine propelled by an electric motor, with power supplied from stations on the earth. I have not accomplished this as yet, but am confident that I will in time. When I found that I had been anticipated as to the flying machine, by men working in a different field I began to study the problem from other angles, to regard it as a mechanical rather than an electrical problem. I felt certain there must be some means of obtaining power that was better than any now in use, and by vigorous use of my gray matter for a number of years I grasped the possibilities of the principle of the viscosity and adhesion of fluids and conceived the mechanism of my engine.”"
If you are considering building something basic you need two things. The high speed turbine and the one way air valve. Every youtuber I've seen so far has made the mistake of having the exhaust ports leave the case in the middle! This doesn't help create the vacuum! If anyone wants to see exactly how I stumbled upon Nikola Tesla’s trail of clues. I’ll tell you where the biggest one is. Start a numbered table of parts. By the end of doing both patents you will have a HUGE clue staring you in the face! Patent 1,061,142 is an air pump. Add the two together then you have? Those patents are not two patents. They are actually one patent disguised as two patents! Tesla writes that when rotor hits critical RPM it won't explode it will implode. "Although Tesla's dream for his engines application in aircraft was not realized in his life time, if allowed to be used in aircraft today, it would provide a quiet, safe, simple and efficient alternative to our supposedly advanced bladed turbine aircraft engines. It has been estimated that an increase in fuel efficiency of a factor of three could be realized in aircraft and thus substantially reduce pollution. Not only this, the Bladeless Tesla Turbine Engine can turn at much higher speeds with total safety. If a conventional bladed turbine engine goes critical or fails, watch out, you have exploding parts slicing through hydraulic lines, control surfaces and maybe even you. With the Bladeless Tesla Turbine this is not a danger because it will not explode. If it does go critical, as has been documented in tests at 85,000 rpm, the failed component will not explode but implode into tiny pieces which are ejected through the exhaust while the undamaged components continue to provide thrust to keep you airborne. We. can only speculate on the human suffering that could and should be averted." Tesla's British patent 24,001 - 1910 design was to prevent this! Last edited by soundiceuk; 11-26-2018 at 02:22 PM. A good researcher from Ukraine (Dnipro city). The bit about the nozzles was most interesting. Do you speak his language? Luckily I am able to translate the text. If you can speak his language. Please can you inform him that in order to run on atmospheric air pressure he needs to build the Tesla valve and he will also need a throttle plate or it will implode from speed. Tesla's design is an air powered vacuum pump. If he wants more torque then attach turbine from 1,061,142 patent. Air pump! A way of visualising what is happening inside the turbine to create such vacuum. The rest of the video just shows how dumb machines have become to make money. If you want an air compressor bolt on a 1,061,142 patent and change the discs of the rotor to discs with no holes. Its says so in the patent. So replace the motor with a turbine and one way valve to diode the inlet. Ensure good exhaust ports much bigger than inlet. Create the initial vacuum and you have a vacuum! Last edited by soundiceuk; 11-26-2018 at 02:55 PM. If you look at the patents 1,061,142 & 1,061,206 as one patent, they form one machine incorporating two turbines. The first turbine extracts the air from atmosphere using vacuum, the next turbine pumps the air out of the first turbine. The second turbine is an amplifier. The 142 patent even fits the 206 patent. Tesla left a hole in the bottom of the casing on the 206 patent for the 142 to fit. The part numbers start at 1 on the 142 patent and go up to 12. They continue on the 206 patent from 13 and go up to 29. It is secretly one patent and one machine. With many possible configurations. The main function that has been hidden is it's ability to run on atmospheric air. DO YOU THINK THESE PATENTS WOULD EXIST IN PUBLIC DOMAIN IF TESLA WAS COMPLETELY TRANSPARENT? Last edited by soundiceuk; 11-27-2018 at 04:20 PM. Here is a high resolution cleaned up version of Tesla's one way air valve. This component is critical if you want to run on atmospheric air pressure. Here is a video done by one of the youtubers that listened to my advice on the exhaust. The exhaust is critical to making high vacuum. All he needs to do now is add the one way valve and an air tap. Adding the 1,061,142 patent turbine onto the exhaust will amplify the output. Here is a cleaned up version of Tesla's final turbine rotor design.